This name uses Spanish naming customs: the first or paternal family name is Pérez and the second or maternal family name is Rubalcaba. 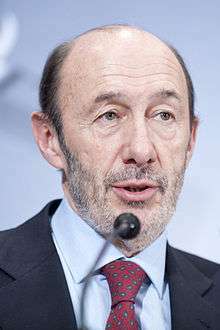 Alfredo Pérez Rubalcaba (Spanish pronunciation: [alˈfɾeðo ˈpeɾeθ ruβalˈkaβa]; born 28 July 1951) is a Spanish politician who was General Secretary of the Spanish Socialist Workers' Party (PSOE) from 2012 to 2014. He served in the government of Spain as Minister of Education from 1992 to 1993 and as Minister of the Interior from 2006 to 2011; in addition, he was First Deputy Prime Minister from 2010 to 2011. He holds a PhD in Organic Chemistry from the Complutense University of Madrid. He was born in Solares village, municipality of Medio Cudeyo, in Cantabria autonomous community. He obtained a doctorate in chemistry at Complutense University in Madrid, where he went on to become a professor of chemistry, specialising in reaction mechanisms in organic chemistry. He represented Toledo in Congress from 1993 to 1996, Madrid from 1996 until 2004, Cantabria from 2004 to 2008 and, despite not being Andalusian, was put forward for the safe parliamentary seat of Cádiz in the 2008 election, which he won. Rubalcaba was appointed Minister of Education and Science in 1992 by President Felipe González. The following year he was made Minister of the President's office and Relationships with Congress, an office he had to abandon in 1996 when his party lost the elections. In the successful campaign of 2004 he worked as chief strategist. When José Luis Rodríguez Zapatero formed the new government, Rubalcaba was appointed Majority leader until 2006 when he succeeded José Antonio Alonso as Interior Minister. On October 2010 he added to his functions the position of First Deputy Prime Minister and Spokesperson of the government. As it became assumed that President Zapatero was not going to seek reelection he became favorite to succeed him with Carme Chacón as his only rival in the primaries. Nevertheless, in May 2011, Chacón announced that she was withdrawing from the race and in June the Party announced that no other candidate had filed and Rubalcaba became the PSOE's Prime Ministerial candidate for the 2011 general elections. On 8 July 2011, he resigned from his duties in the government in order to focus on the general election campaign, which he lost getting the worst results in PSOE's history. He filed to succeed José Luis Rodríguez Zapatero as PSOE's General Secretary and won the vote, held in February 2012. He received 487 votes against 465 for Carme Chacón. Pedro Sánchez was elected to succeed him as party leader on 13 July 2014.